This November, Wahaca will celebrate Mexico’s famous Day of the Dead festival in the St David’s Dewi Sant with a week-long celebration of delicious feasting menus, specially crafted cocktails and traditional decorations from Monday 29th October – 4th November. The week will be a positive celebration, giving customers the chance to get involved with the true meaning of Mexico’s Day of the Dead tradition in remembering their own favourite people. 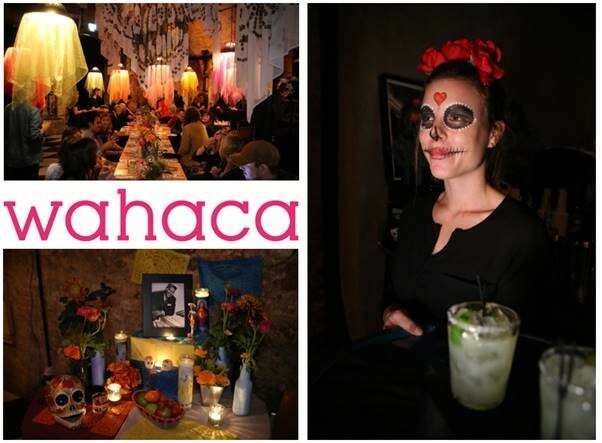 In tribute to Mexico’s world-famous Dia de los Muertos, Wahaca co-founder Thomasina Miers and her team will invite guests to celebrate with a specially designed feasting menu available throughout the week. The menu (£25) will feature seasonal specials including the likes of chargrilled squash grown especially for Wahaca by the team at Riverford Organic, freshly baked cornbread with whipped goat’s cheese and chilli jam, as well as locally cured Trealy Farm chorizo quesadillas, and a freshly shaken ‘Marigold Margarita’ with 100% agave Olmeca Altos Tequila that references the celebration’s signature flower. To further get diners into the spirit of the festival, the restaurant will be decorated with traditional papel picado and a shrine installation where guests and Wahaca’s team are invited to add their own memories of loved ones they’ve lost. Not to be confused with Halloween, Day of the Dead is an annual festival, recently made famous by films from James Bond to Coco, held in Mexico and across South America in honour of those who have died to ensure their memories still live on. A colourful explosion of food, dancing and reflection, people are encouraged to gather and celebrate to help those who have departed on their spiritual paths.